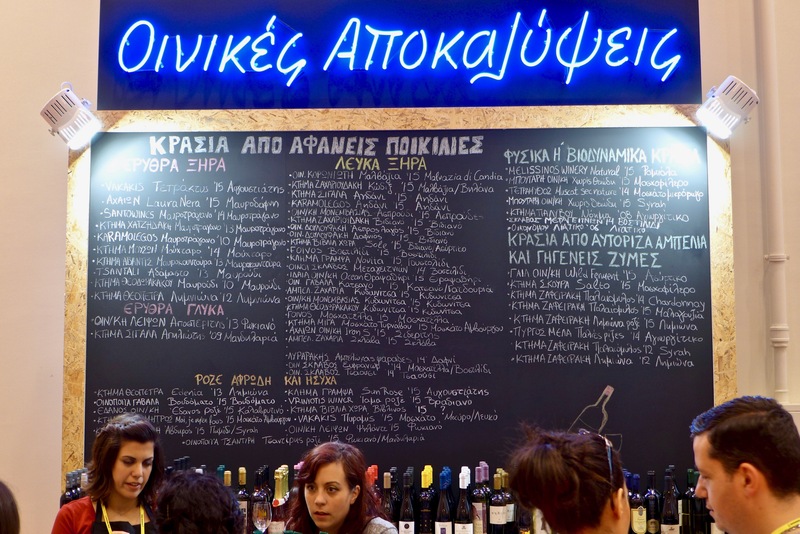 The very last time I went to a wine fair was a couple of weeks ago when I attended Oenorama 2019, which is the biggest and most inclusive Greek Wine Fair. This time, I was there to taste, but also to help my good friend Dimitris Stergiopoulos at his Masterzen wine cabinet stand. It's so much more fun for me, when I feel I can somehow be useful and can do my tasting in small sessions. That way my senses are not ‘swamped’. Nevertheless, the strangest thing came about me. As I had taken my glass in one hand, my notebook and pen in the other and was about to embark on my tasting round, I looked into the hall I was about to enter and felt utterly overwhelmed. For a split second I wondered if there was any point in going into the exhibition at all. The big hall, the wine stands, the numerous people, the hustle and bustle, the buzz of the voices made me feel that I didn't want to make the effort of pushing my way into getting my glass close enough to the wine. Don't get me wrong. The venue is beautiful. High ceilings, wide halls, very spacious. I'm not sure what it was that felt so overpowering. I just felt lost. And the truth is that at these fairs, you have quite a mix of people. Which is fun and interesting, but can also prove quite tedious. Not all have manners and not all are willing to share the stand they are at with other people. Many times you will find three or four people lounging in front of a stand, with their wine in hand, talking, laughing and not budging, barring other people from having access to the particular stand. Actually, the first time I had this feeling was last year, when I visited the Food and Wine Expo. The drive to get there took 15 minutes from my home, and more than 40 minutes in the standstill traffic to park the car. I then had to wait for a bus to drive me from the parking lot to the expo. Once there I had to wait in a queue for another 15 minutes, although I had pre-booked, to step into a huge toll, where just the walk to get to the place I wanted took another quarter of an hour. And all of this was at 10:00 am! I looked at myself sadly. Why was I doing this to myself? Did I honest to God need this? I’m sure you can imagine what the traffic was like when I left the venue, around 3:00 pm. I think it took me more than an hour to get out. I had spent about five actual hours inside the expo, I had literally visited no more than 20 stands, and had come away feeling a wreck. So, as I looked on, I thought to myself that there is something inherently wrong with these huge fairs. I realise they are necessary, particularly for buyers who are travelling from elsewhere, and who need to be able to spend a few days in a certain place where they can find everything gathered under one roof. I realise that if something has caught on and is a worldwide trend, there is obviously a need for it. I just pondered on whether there is a way to make this whole thing a little more friendly. Whether there is a way that will not exhaust one, before one has even had time to start tasting. I’m sure you all know from experience that the only way to go around these fairs is to have done some homework previously, to have picked out the particular stands you will be visiting, so as to navigate through the fair slightly less copiously. The thing is, that this way, you will probably miss some interesting things that would have been worth trying. And somehow I feel that most buyers are attracted to more or less the ‘familiar’ brands. Bigger houses, that are probably already exporting and have probably had articles written about them from renowned critics. Wines that you can find tasting notes and vintage reports on. This brings me to the question whether smaller, less known houses get the chance they deserve, although they have probably spent quite a big sum of money to take part in these fairs. You see, the problem is that if you go into a fair and just start tasting anything in front of you, it will be completely chaotic and endless. You would need a full week to take you around and you probably wouldn't have tasted everything. How can we make these fairs more functional? Oenorama has two featured halls. One includes all the small or new producers (up to 30.000 bottles production) together with a bar that hosts wines made of interesting indigenous varieties and natural wines (Wine Revelations), and a second (Tasting Room) hall which is a self-pour set up with about 250 wines that the producers have offered as the most representative of their region and is open only to professionals. These two halls are a breath of fresh air, within the huge fair. It seems to me that maybe that is the way to go. To somehow separate the wineries into smaller clusters that are themed in some way. That could help anyone, whether well read or amateur, whether escorted by a local or not, to be given a chance to taste a variety of wines from the well known or the lesser known wineries. Maybe they need to be themed according to region, maybe according to variety, maybe according to style of wine, maybe according to innovation. I’m brainstorming. I’m not sure. I just feel it would be more useful if the halls were somehow split into smaller pieces of information that facilitate the work of the taster. Sort of, in the way books are made up of chapters. There is not one way of achieving things. Sometimes we all need to pitch in with ideas and we may end up with something that makes us all a lot happier. A South-African Greek who has practiced psychiatry and analytic therapy for the greater part of her career, but is also in love with wine. She attained the WSET Level 3 qualification and is currently trying to blend these seemingly disparate interests. Writing about the different brews and the people behind them is her newfound enjoyment. She has also recently started oenophilesandfoodies.com, to promote Greek wine, olive oil and honey. You can find more of her writing on the blog she keeps. She will be contributing to the site on a monthly basis. Other articles by Olga here.